Public outreach is an oft used and abused term nowadays, but I find it the wrong label for astronomy. In Astronomy we are reaching out for the stars! What is really meant in this context is knowledge sharing and encouraging people to raise their eyes to the stars. I found it somewhat depressing that a survey published this week showed one in four Americans were unaware that the Earth orbited the Sun. This shows that there is a real need to get the message out, not only about astronomy, but basic STEM as well. Astronomers in general are a very approachable bunch of people almost always ready and willing to share their thoughts knowledge and more importantly their telescopes. This can be quite formal at pre-arranged open nights such as the Dark Sky Festival in Harmony, Florida, Astronomy Club open days, or casual visits to planetariums etc. 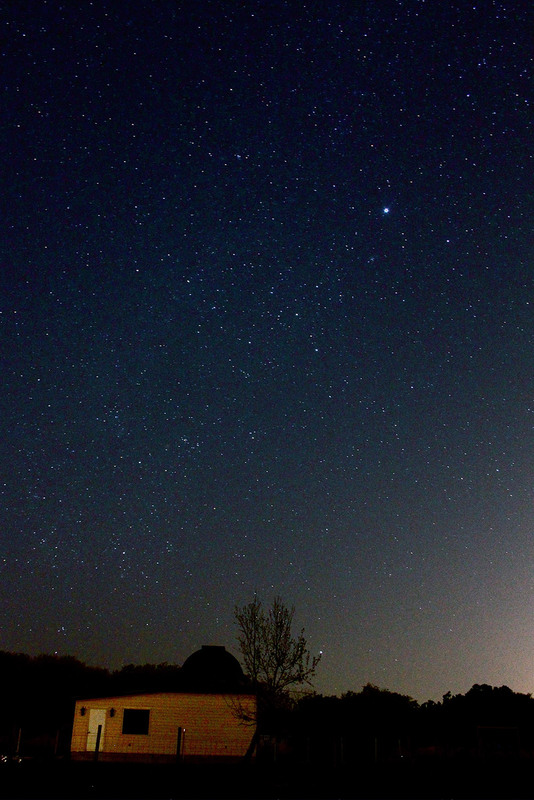 In the UK we have a special week where the BBC encourage interest in space and astronomy with Stargazing Live events staged across the country. Most astronomy clubs hold open days when newcomers or people just generally interested in having a look through a telescope can come along and take part. Most clubs will be happy to accommodate visits to their dark site events, just look up your local club on the Internet and get in touch. Another form of outreach involves planetariums. These can either be static such as found in local museums or transportable ones like the blow up StarDome run by our very own RocketSTEM contributor Andy Green in the UK. These bring the Universe into cities and classrooms to provide a realistic model of the night skies without having to dodge the clouds or other adverse weather conditions. However the most selfless form of outreach I would describe as Private Outreach. There are a number of astronomers who have private observatories and open them up to the general public. Foremost among these was the late Sir Patrick Moore in the UK who was a great promoter of popular astronomy, providing maps of the Moon to NASA for the Apollo Moon Landings that were created from observations made in his backyard. I am going to focus on a relatively recent example: The Kissimmee Park Observatory on the banks of Lake Tohopekaliga in Florida. The KPO was designed and built by David Hearn who is, of course, a big astronomy fanatic. 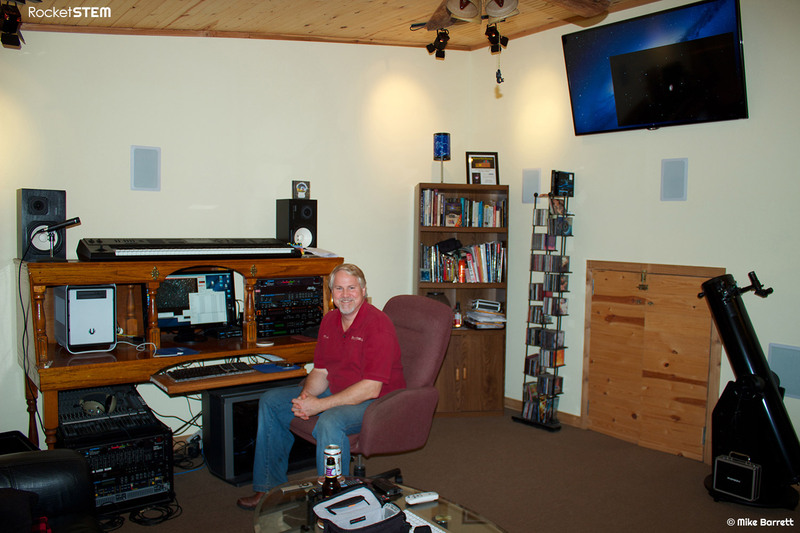 I met David at the Harmony Dark Sky Festival back in 2013 shortly after the completion of his observatory. It was here that I learnt that once fully up and running he would be holding regular (and irregular) open nights when people could come over and learn about our night skies. These are held around each new moon, weather permitting, or by appointment. I thought it would be interesting to describe the observatory to get an insight as to the workings of a serious amateur astronomy setup. The observatory was built over a number of years, with the planning phase started in 2009 and first light occurring in December 2012. The observatory is in a great location, there are dark skies to the south, with little light pollution. The northern aspect is less ideal with the light dome from Kissimmee and Orlando encroaching on the view. However it is just a few minutes drive from St Cloud and is very accessible by road. As with most things it is a balance between location and accessibility and the KPO has got it just right. The observatory itself is a multi-use facility split into two main parts. It consists: a 12 foot Observatory Dome with viewing platform; and a Warm Room / Studio / Workspace (often called a Man Cave). The Observatory Dome houses an 18 inch reflecting telescope, along with various smaller telescopes for finding and guiding, plus computers to control the entire system. The warm room is a bit of a misnomer as it is in Florida and has air-conditioning, but does serve to environmentally isolate the two sections. Both areas are connected via a local network to the main house which is where the power for the observatory originates. The Observatory Dome has been installed some 10 feet above ground level with the observing deck 5 feet below. As the dome is round and the observing deck is square there are plenty of recesses for equipment computers and general storage, not forgetting the observing ladder. The observing ladder is required to gain access to the eyepiece of the telescope that may be positioned way above head height depending on what object the telescope is pointed at. The telescope is mounted on what is known as a pier. The pier, in this case, is effectively a concrete pillar rising 10 feet above ground level having a 3 foot cubed footing for stability. The footing is isolated from the main floor of the observatory to ensure that movement in the Dome or Warm room are not transmitted to the telescope causing it to wobble. Having all this concrete may seem like overkill, but not when you see the telescope. 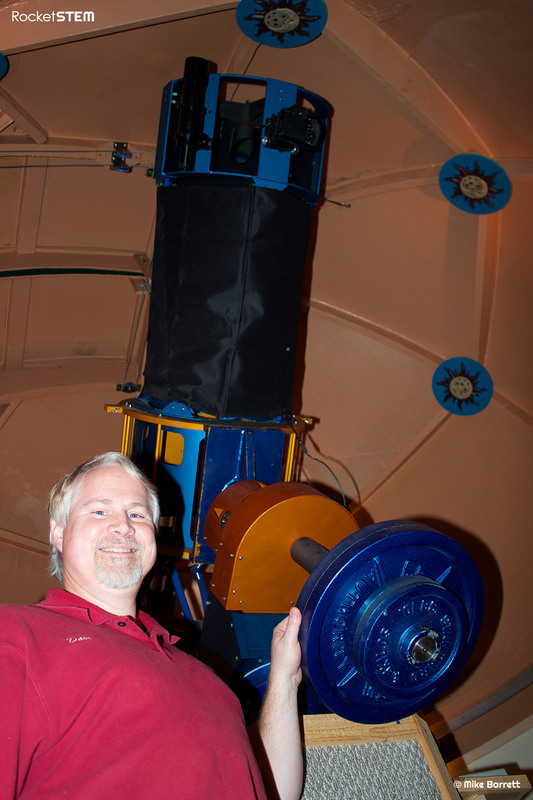 The telescope is an 18 inch reflector, meaning that light falls on to an 18 inch mirror. This is then concentrated onto the secondary mirror back near the top of the telescope. Having an 18 inch aperture means that the telescope itself is quite long and heavy, which in turn means it needs some hefty counter-balance weights. From this you can see the need for the substantial pier to mount it on. Apart from the main telescope there are a number of other telescopes that piggy-back onto the main optic. These are used for finding the correct area of the sky and for locking the telescope onto a star to guide it accurately. In fact these telescopes are actually as big as a lot of amateur astronomers main telescopes. The telescopes are all attached to a German Equatorial Mount. This allows the telescope to be set up so that when the star or object you want to view is in the center of the image all you need to do is to move the mount on one axis. This requires correct and precise alignment of the mount, which I will cover in a later article. To keep the object in view the mount has motors that move the telescope at the same rate that the stars move through the sky. Obviously for the stars to be seen the dome needs to be opened. The dome has sliding doors that open to allow a portion of the sky to be visible. The telescope itself stays inside the dome protecting it from the wind and rain. Indeed should the weather turn nasty it is a quick and easy task to close the dome shutters and seal the telescope in the dome. As I mentioned above the mount moves at the same rate as the stars. This means that over time the telescope will move away from the open slot of the dome. To keep the telescope in the center of the opening the entire roof revolves on a wheeled system. This is currently a manual operation, but could become automated at some later point. So with the telescope set up and running what do you do? Simple you go downstairs to the ‘warm room’ and have some fun while the telescope is automatically moving and taking pictures. 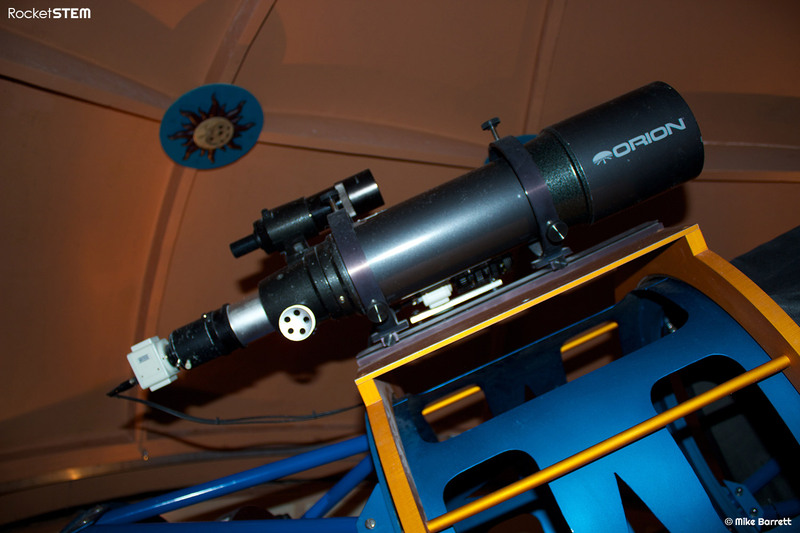 With the networking facilities available in the observatory you can even control all the features of the telescopes. Kitted out with a large screen TV and full studio facilities you can either relax and enjoy or, as David often does, use it to present astronomy programmes as part of his outreach project. All you need to remember is to run upstairs every so often to nudge the dome round. To see more details about the construction of the observatory visit the Kissimmee Park Observatory website at www.kpobservatory.org. You can contact David via FaceBook at www.facebook.com/kpobservatory to arrange to visit the observatory. I have used just one example here to explain how an observatory works, but there are many similar establishments scattered around the World. Why not look up your local Astronomy Club on the internet and see if they have a programme of events for you to join in. If you are an educator why not approach your local club and see if they will come to your school and do a presentation. Our club gets lots of requests and we always manage to find some members to go out and spread the word!